The cold split that just occurred in the AFL-CIO has opened up a new page for US labor. As Bill Fletcher has observed in several excellent articles on the issue, the “debate” leading up to the split took place far over the heads of the members of the unions who pay the salaries of the leaders. Now those of of us on the ground of labor — the activists on the shop floor, the people who do the Jimmy Higgins work of unions, as officers of locals or active members, the people who show up on picket line rallies and labor events — are confronted with a bizarre scenario. Friends of many years find themselves on opposite sides of a cleavage that they had no say in creating. AFL-CIO labor councils must exclude long-time members and leaders. Will local areas now be represented by two union federations? How will the opposing groups define themselves? Will raiding become the norm between the factions? These are practical problems that will immediately confront us. In my area, the Capital District of New York State, the Albany area, I am pushing for an organized discussion, a forum on the split. I would like to see the activists and members of local unions have some input in what will happen next. Better a belated discussion than no discussion at all. The members of unions need to find a way to rein in our leaders, at the very least. We are in the initial phase of organizing such a forum this November. Take the spectacle of the Aircraft Mechanics Fraternal Association (AMFA) strike at Northwest Airlines, for example. As with the Professional Air Traffic Controllers Association (PATCO) strike back in 1981, an airline union is left swinging in the wind, due to inter-union rivalries and craft divisions. My own union, the International Association of Machinists, is even seeking to take AMFA’s work, as payback for the Northwest mechanics voting the IAM out in favor of AMFA. That’s the price that workers pay for the absence of the Debsian perspective. The Million Worker March movement, as problematic as it turned out to be, showed us some leadership developing, particularly in the African-American section of labor, not married at the hip to the Democratic Party and a strategy of endless concessions to the employers. 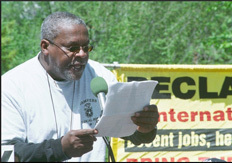 One of the leaders of the MWM, Chris Silvera, heads the caucus of Black Teamsters, which recently voted to support the September 24 anti-war demonstration in Washington, DC. We need to find a way to bring such forces together, so that we can confront the clashing groups of labor officials with a program that can really reverse the long slide of US unions. Jon Flanders is a member and former president of IAM LL 1145 and a member of the Troy Area Labor Council, AFL-CIO.